I did say we got really close to the humpback whales. 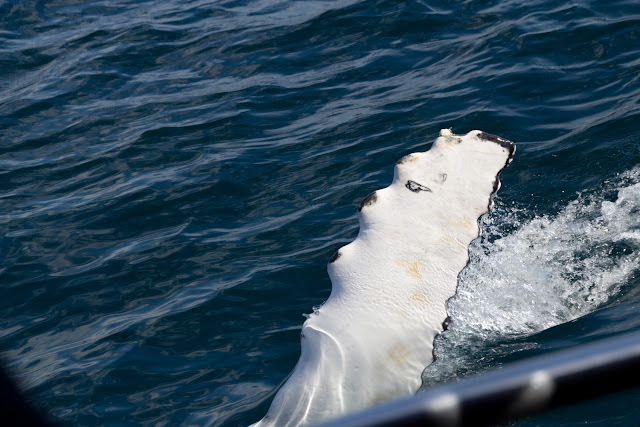 Well, this is how close you get on a whale cruise from Húsavík, Iceland. The photo was taken with a Canon 60D and 77mm focal range. And the thing you see in the foreground is the railing of the boat we were on. Behind it you see the pectoral fin of a humpback whale. These whale cruises are just incredible and I can only really recommend it to everyone who get's a chance. Ich hab ja gesagt, wir sind richtig nah an die Buckelwale herangekommen. Hier seht Ihr, wie nah. Wir waren auf einer Whale Cruise in Island in Húsavík. Das Photos ist gemacht mit einer Canon 60D und 77mm Brennweite. Das Ding, was ihr im Vordergrund seht, ist die Railing unseres Bootes. Dahinter ist die Brustflosse eines freundlichen Buckelwals. Diese Walfahrten sind unglaublich und ich kann sie jedem nur wärmstens empfehlen.